The Legend of the Spindly Man continues to spread. The children call to Mandy to help, but can even she halt the dark tale from unfolding? 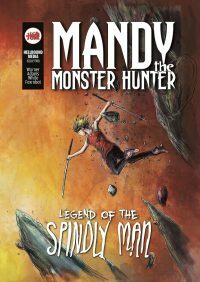 Mandy the Monster Hunter once more returns in the second part of this acclaimed mini series. The Spindly Man has bested Mandy once, but she was unprepared then. Now she’s seeking him out, and preparing to put an end to his evil curse. But can you truly kill a legend?